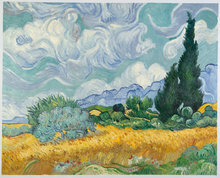 One of Van Gogh’s most iconic paintings: a swirling blue sky punctuated by the golden light of stars and from the moon. Below is the southern French town of Saint-Remy-de-Provence. "It's what I expected and more! Thousand thanks ! The thickness of the paint, the quality of the canvas. - Alexandre"
“This beautiful morning I beheld the countryside from my window long before sunrise, it was dark and beautiful with nothing but the morning star”, these are the words van Gogh wrote to his brother Theo, while based in France. 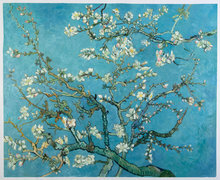 This beautiful 1889 masterpiece has been reconstructed, detail by detail, very close to the original painting. Our artists have examined the skills used by van Gogh which includes brush lashes, color mixing, feel and cadence of application. Starry Night is one of the most acknowledged paintings in today’s modern world because it invokes deep emotions, from the peacefulness of the church tower to the carefree use of lively colors in the night sky. We take pride in our handmade authentic reproductions by our respected artists. Picture the artist as he moves, twists and turns the brush to design the dance between the stars and the clouds above the quiet and serene village while preserving the country’s rich tradition. It has been widely debated and appreciated for its importance on interior, emotional life, depiction of night and the spiritual power it contains. This can be seen in the swirling and wild representations of the sky. The night sky feels like a rolling ball of energy. The sky glows in yellow spheres and a flame-like cypress known for death and eternal life links the earth and sky. The painting has inspired art lovers and scientists which has led to several discussions, theories about the meaning behind the painting. The Starry night was painted by Van Gogh in a mental asylum in St. Remy and this has made historians believe that his work reflected his troubled state of mind. The astonishing way the stars were painted in this masterpiece make historians think he was interested in astronomy. Till this moment the real meaning behind the painting is still unknown. Starry Night has an evocative spiritualty which advances beyond the representation of the physical world and these markings are what beautifies a home. Since ecommerce has been something, I have made so many online purchases all involving a certain amount of risk. At the end of the day some were successes and some failures. Truth be told, my order with you was one of those that I was most skeptic about - because it’s art and it’s reproduction - and the outcome has been a huge success to my surprise! My friends who shared my concerns at the beginning are now amazed by my Starry Night. Some of them are now frequents to your website trying to pick one for themselves. Actually I am also secretly glancing through the other paintings on the site, already planning my second order. This time I’ll definitely get it in the original size as I am slightly regretful for not having done that with my first order. Anyhow Erik, I am glad to have discovered you and your business. Thank you very much for all your patience, answering the questions I have bombarded you with till the day my painting has been delivered. Your service was outstanding and my painting is stunning. You made someone happy. The work is just amazing! I’m so glad I chose your studio over others to get a high quality artwork. 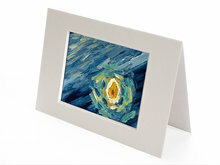 Now the Starry night just needs a frame that fits its style. Our daughter is studying Art and we took her to the Van Gogh Museum last year, combined with a visit to beautiful Amsterdam. 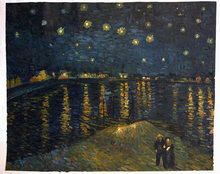 Though she was pretty happy with the printed canvas of Van Gogh’s ‘Starry Night’ we brought back home as a souvenir, my husband I thought an oil reproduction would be an even more special gift for our love’s 15th birthday. This is when I got to know Erik and I am grateful to Google who lead my way to Van Gogh Studio. As of my first contact with him, Erik has been so approachable and professional that we immediately felt we were in good hands. Our expectation on the quality of our painting was already high. But receiving it on the very birthday of my daughter with a personal note hand written for her was beyond any expectation and purely a beautiful surprise. Our daughter couldn’t be more happy. A tribute to the refined customer service and elegance of Erik. Thank you once again for having us at the studio last week. We landed back home yesterday and guess what?! Our Starry Night had arrived before we did! When you mentioned the 4 days delivery time to NYC I wasn’t sure if you really meant that but you actually did! And just like you said, it came in perfect shape thanks to the tube protection. We are off to the framers now to get our beautiful souvenir ready to hang. Thank you so much Erik for your hospitality and great service. We will definitely come back! 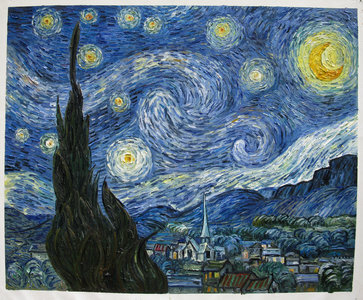 This painting of Starry Night makes me smile every time I look at it. I previously purchased a Print of it from another site, and while it looked good, this blows it out of the water. The attention to detail and vibrant colors of the oil on canvas make this painting my new favorite in my entire house. I spent a lot of time looking at other reproduction galleries but none of their Starry Night reproductions met my standards until I found this one. 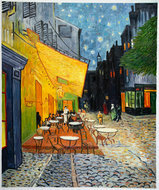 I want to thank Erik and everyone else at Van Gogh Studio for their great customer service and fantastic paintings. I will be buying Cafe Terrace in the future and I cannot wait! Hi Erik, just to let you know: I managed to carry "Starry Night" from Amsterdam to Finland through the customs in the tube you provided. Just like you said, no problems. Today I got the painting finally framed. It just found its place between our naivistic artwork. I am very pleased with the outcome. The painting is even better than what I originally expected. Hoping you all the best. Received the paintings yesterday. Just fabulous! Thank you, off to the framers today. An early Christmas present for myself. Eind van de middag kwam de postbode met het lang verwachtte (ja een dag lijkt soms best lang) pakket. Helaas was man-lief nog niet thuis, dus moest ik wachten tot 10 minuten geleden voor de koker open gemaakt werd. Wat is het schilderij schitterend! We zijn er heel erg blij mee. Nu nog op zoek naar een mooie lijst en hij kan boven de bank. What great news! We just framed the others and they look wonderful! It is a real pleasure to have them hanging in the cottage. It isn’t quite the yellow house, but we are filling it up as we can. Thank you for your professionalism, and if you every try new paintings don’t hesitate to let me know what you’re working on. This is an active area of research for me. Starry Night arrived a few days ago, and I am very pleased. Thank you for working with me. I have revived the paintings and love them. They are fantastic. Thanks so much for your assistance in helping along the way. I'll eventually look at the "Cafe' Terrace" sometime in the future as well and will let you know when. It's what i expected and more ! Thousand thanks ! The thickness of the paint, the quality of the canvas.